Sometimes baby needs a little help falling asleep. 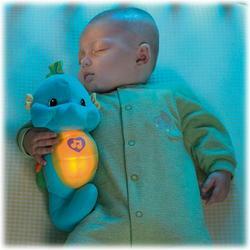 With a gentle squeeze, this cuddly friend glows and plays soft music, lullabies and soothing sounds of the ocean. After five minutes the music fades, lights dim, and baby drifts to sleep ? 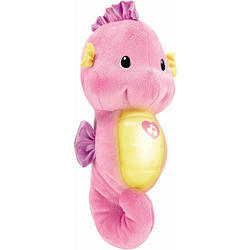 Includes 8 lullabies and power/volume control for quiet play! Requires 3 AA batteries. Recommended Age : From Birth and up.